NU-TEK has developed the most effective, scientifically advanced, sustained-release protein supplement ever! 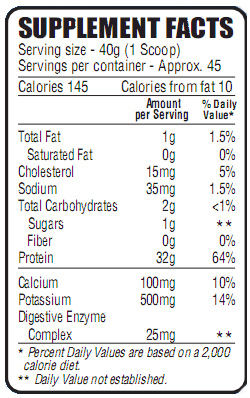 Gone are the days of low quality “whey only” protein supplements. Gone are the days of those blah tasting protein powders that promise much but deliver little. PRO5™ is a delicious proprietary blend of Whey Isolate,Whey Concentrate, Potassium Caseinate, Egg Albumin and Micellar Casein. Each type of protein is broken down and absorbed at a different rate, allowing your body to utilize protein over an extended period of time. PRO5™ is enriched with BCAA’s, Glutamine Peptide as well as all the Essential Amino Acids which are absolutely necessary for increasing and maintaining lean muscle while simultaneously aiding in the elimination of body fat. PRO5™ also contains a proprietary natural digestive enzyme complex to improve digestion and assimilation, thus reducing bloating commonly associated with other protein supplements. Because of our unique proprietary blend of ingredients scientifically combined in specific ratios for the sustained release of amino acids into your bloodstream, this formula cannot be duplicated. 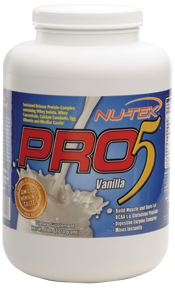 If you’re looking for the most effective, best tasting, quality sustained-release protein supplement to enhance and attain your fitness goals, look no further than NU-TEK’s PRO5™. Even though PRO5™ is enriched with Glutamine Peptide, it is recommended that it is combined with a quality Glutamine supplement for increased effectiveness and accelerated results.